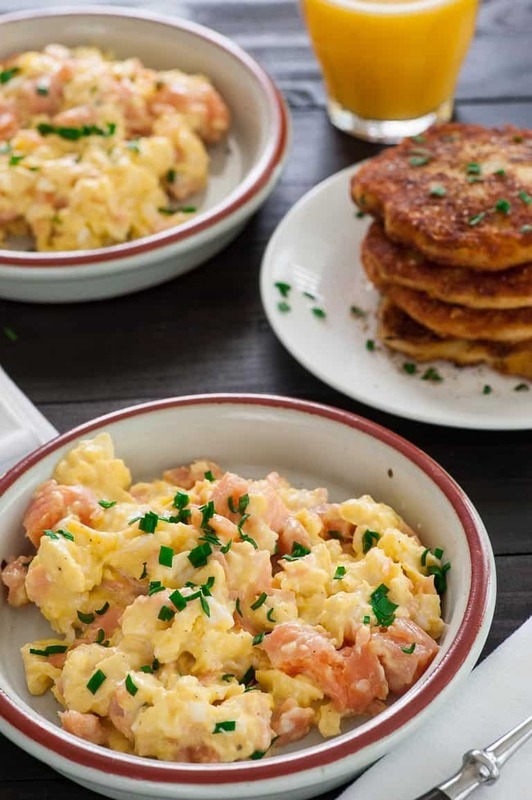 Creamy scrambled eggs with smoked salmon takes breakfast to a whole new level. It’s so good in fact, you’ll want to serve it for supper. As you’ll notice, I’ve been on a smoked salmon jag recently. Maybe it’s because I picked up a 20 ounce package of cold smoked salmon. 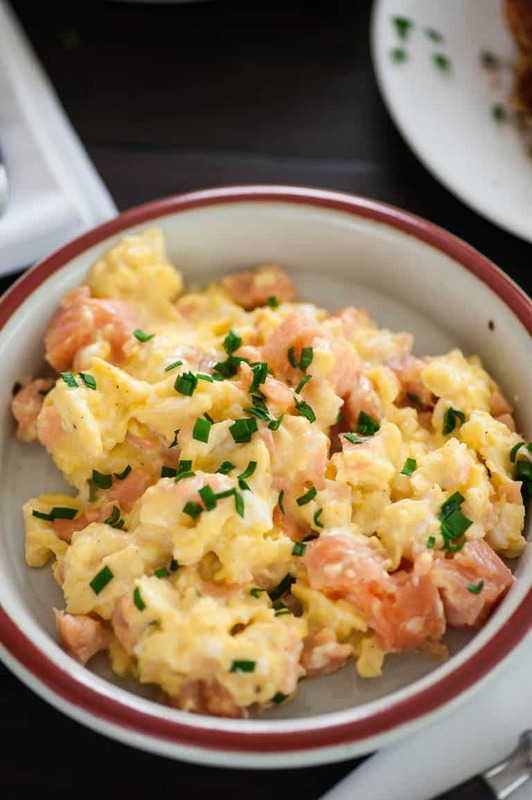 The idea for scrambled eggs with smoked salmon came from Mary Jo. Some time ago, she had gone on a ladies morning biking excursion to Bon Appetit, which is a fancy restaurant here in Dunedin, right on the water by the local marina. They serve a limited menu breakfast for the people who stay at the nearby Best Western motel. She of course had their scrambled eggs with smoked salmon dish. So this leads us back to this breakfast meal, which we had for our supper last night. The day before, I made pork chops with reduced heavy cream and peppercorns, served with mashed potatoes. (Yum by the way)! I always make too many potatoes for the two of us, and Mary Jo was quick to point that out. So I said, “Okay, we’ll have breakfast for supper tomorrow and I’ll fry up some potatoes to go with.” Well, we are sitting on about 12 ounces of smoked salmon in the refrigerator and Mary Jo remembers the scrambled eggs with smoked salmon from a couple years ago. So this recipe is an approximation of what she can remember the Bon Appetit scrambled eggs tasting like. 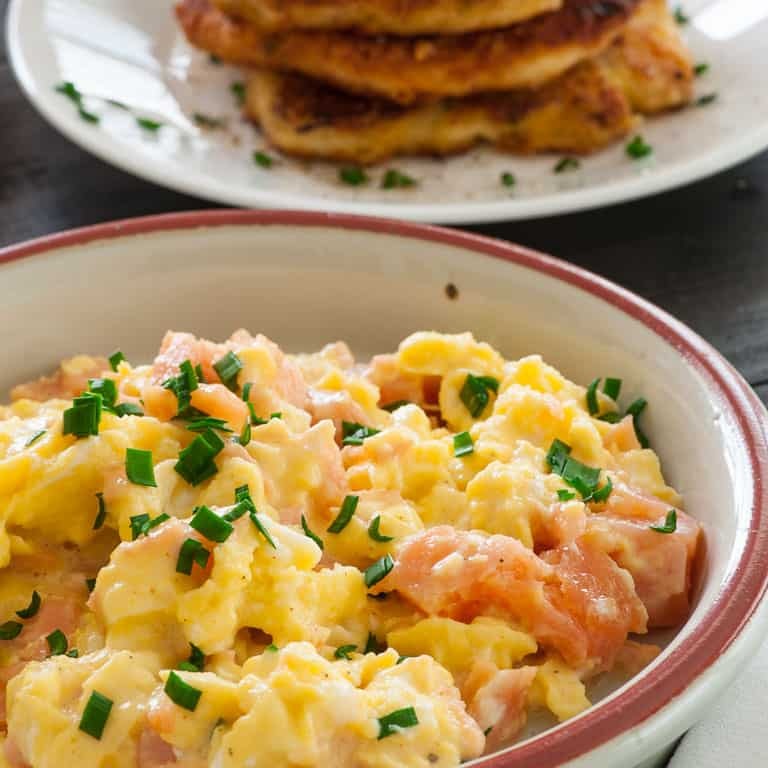 To make the scrambled eggs creamy…this is by the way, Creamy Scrambled Eggs with Smoked Salmon…a bit of cream cheese and heavy cream were mixed in with the eggs. 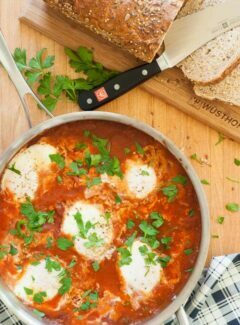 This definitely made the eggs moist and tender, that, and not over cooking them. 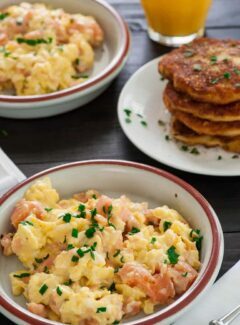 The smoked salmon is chopped into small pieces and added to the scrambled eggs just when the eggs start to clump up and not be runny. From that point, it’s only another 30 to 40 seconds before the eggs are done. Just mix everything up and transfer to a serving dish. Our friend Manny, just brought over a plant of garlic chives that he’s been growing. The chives made a wonderful garnish for the eggs. Chopped scallions could also be used. I used six eggs in this recipe and with the cream and cream cheese, makes for a pretty rich tasting dish. It will serve 4 people easily, especially if you have a fried mash potato patty along with it. If you like smoked salmon, this is a recipe to try. 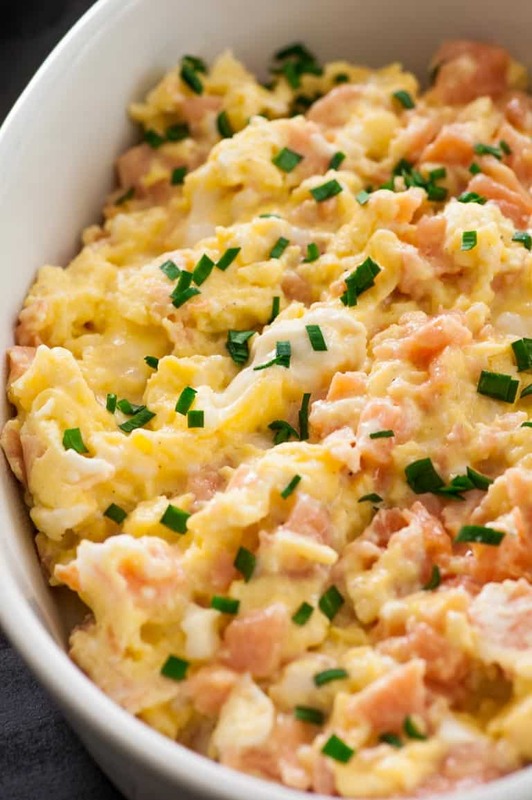 Smoked salmon mixed in with some creamy scrambled eggs makes a delicious meal. 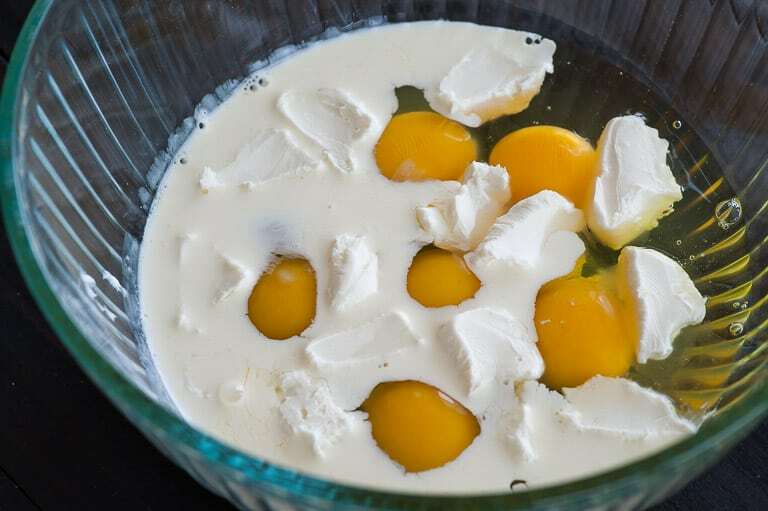 Crack eggs into a medium sized bowl then add the heavy cream, the pieces of cream cheese, salt and pepper. 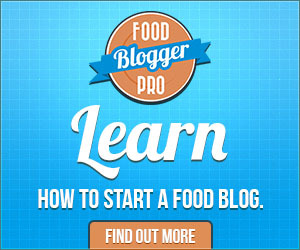 Use a whisk to beat the ingredients together. Once the eggs are nearly done, (2 to 3 minutes), add the smoked salmon and stir in. Heat the salmon for 30 to 40 seconds, then transfer the eggs to a serving dish. Garnish with chives or scallions. This is on the “gottahavitsoon” list!!!!!! 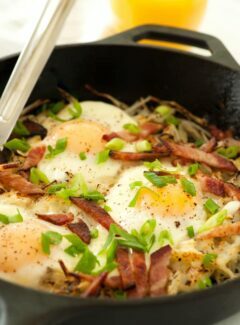 This is delicious for breakfast, brunch, lunch, or dinner. A brunch with mimosas would really be special!